A superb Queen Anne Oak Chest on Stand, with original handles & escutcheons. The stand has four cabriole legs terminating with pad feet. 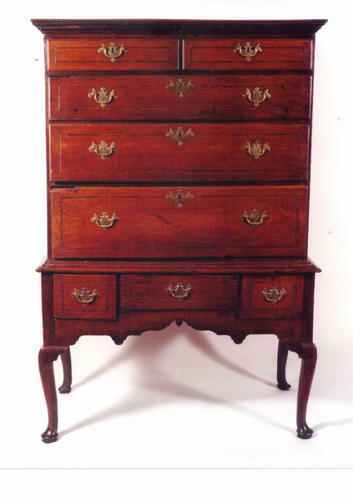 The drawers are inlaid with Bog Oak & Holly stringing, & still retain the original Oak linings. This very piece of furniture is illustrated on the back outside cover of David Knell's book "English Country Furniture" (2nd edition).